When it comes to the World Cup Jabulani football, seen here, perfect may not be good enough, according to scientists who have analysed the controversial ball. When it comes to the World Cup Jabulani football, perfect may not be good enough, according to scientists who have analysed the controversial ball. Experts puzzling over its allegedly erratic flight -- which has unnerved more than one goalkeeper in South Africa -- have concluded that the Jabulani may simply be too round to fly straight. Since being chosen for the World Cup, the Adidas-made ball has come in for a serious drubbing. Spain's Iker Casillas has dissed it as "rotten," while Italy's top goalkeeper Gianluigi Buffon tagged it as "unpredictable." Julio Cesar of Brazil suggested he could do better buying a ball in a supermarket. Part of the problem may be that "the stitches of the Jabulani are internal, so the ball resembles a perfect sphere," said Eric Berton, deputy director of the Institute of the Science of Movement in Marseille, France. In other sports -- tennis, golf or baseball -- the balls have irregularities precisely to insure a more stable and controlled trajectory. The ridges or exposed seams are what make possible spin in tennis or a curveball pitch in baseball. Despite the Jabulani's so-called 'grip'n'grove' texturing, however, the ball apparently doesn't behave in the same way. "Because of the shape, the time of contact with the foot is reduced," said Berton. "As a consequence, it practically doesn't spin. The ball travels a little less far, and will have a floating and unpredictable trajectory, whether for a striker or a goalkeeper," he told AFP. Wind-tunnel tests conducted by Kazuya Seo of Yamagata and Takeshi Asai University in Tsukuba also found that the machine-made Jabulani was close to a perfect sphere, and has a tendency to slow suddenly in mid-flight -- a disconcerting characteristic for footballers. Australian scientist Derek Leinweber, based at Adelaide University, concluded after a series of computer tests that the ball goes faster and is more unpredictable than its predecessors. "That means the goalkeeper can no longer really anticipate its trajectory," he said. 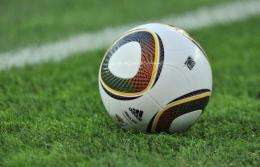 The Jabulani -- "to celebrate" in isiZulu -- "allows for maximum control, stable flight and perfect grip under all conditions," FIFA said in unveiling the controversial ball. The ball is constructed of eight thermally-bonded polyurethane panels, and is very nearly waterproof. Adidas has defended its product. "There are strict FIFA guidelines on the ball (weight, size, bounce depending on what the temperature is)," commented the German company. "Not only does our ball fulfill all these conditions but in fact they go beyond them. Probing Question: How do dimples make golf balls travel farther? Not only does our ball fulfill all these conditions but in fact they go beyond them. That there is the problem. The ball should stay the same old average design it has been for a while in order to keep all games as standard as possible. The ball is still going to wear down over time. The very fact that they tried to make a longer-lasting ball is, well, backwards in the realm of business. Business is about making something "good enough", not perfect, perfect is lost profit in both designing it and lost sales over time. Julio Cesar is right - Buy a load of balls from a local supermarket, and toss these Adidas perfect balls to street kids. They have tested this ball (the manufacturers) and found it to be extremely predictable. Using robots, they kicked it at the same trajectory and it hit nearly the same target every time. Other balls don't do that. Another article I read noted that the real culprit may be the climate (weather, altitude, air quality, etc) in South Africa. Most players are not used to playing there, and may be blaming the ball. I've seen every game it is possible to see over the CBC broadcast signal, and in my opinion the ball is just about perfect in every way. The only imperfection that I can see is that it is probably too smooth. That means that it has a tendency to slide off a sweaty bald player's head when he is heading the ball. However, its design gives it a true flight if a kick is skilfully executed. Diego Forlan of Uruguay was the first to learn that fact. I have read that the ball seems to accelerate as it gains altitude. I don't know about that, that may be an illusion. I have observed that all the b.s. shots from far out miss the net by a country mile, which is as it should be, because nobody likes a ball hog (there is no "I" in team). The ball shows an ability to curve in a predetermined manner depending on the spin placed on it by the kicker. Top spin produces a sinker. Same with curve balls. That requires world class playing ability. Some teams got it, some don't. Tell me one world championship where the players didn't complain about the ball. It puzzles me that people act surprised every single time. Same procedure as last year James? How long was a team given Jabulani balls for practice before the world cup? If each team has the same amount of time, then it is fair to every team.